She looked down at her freshly painted toe nails in the mirror and asked herself the same question again. Does he deserve this? As her eyes grazed upwards over her long legs, gentle curves that teased at the right places, flawless skin, narrow, delicate shoulders, slender neck and a face with features so sharp that it had to be chiselled by a surgeon. During her journey upwards, the decision meter shifted slowly and gradually towards no. but she ran out of body length just before the meter went past the tipping point. Well to be fair, he was good looking, caring, smart enough to earn a comfortable living, dumb enough to let her make the decision on how to spend it, in short, almost the perfect package. But, there comes a stage in life when you have to decide. And the question rang again in her mind: does he deserve this? Is he worth her making the sacrifice of the potential of a better husband. She was only 24 and suitors were still lining up. Is he worth the trouble of facing a society that disapproves of such marriages? Is he worth the trouble of fighting the opposition from her parents. Is he worth the trouble of having to spend the rest of your life with a partner that snores? As the questions kept coming in, she noticed that the questions were getting shallower and shallower. 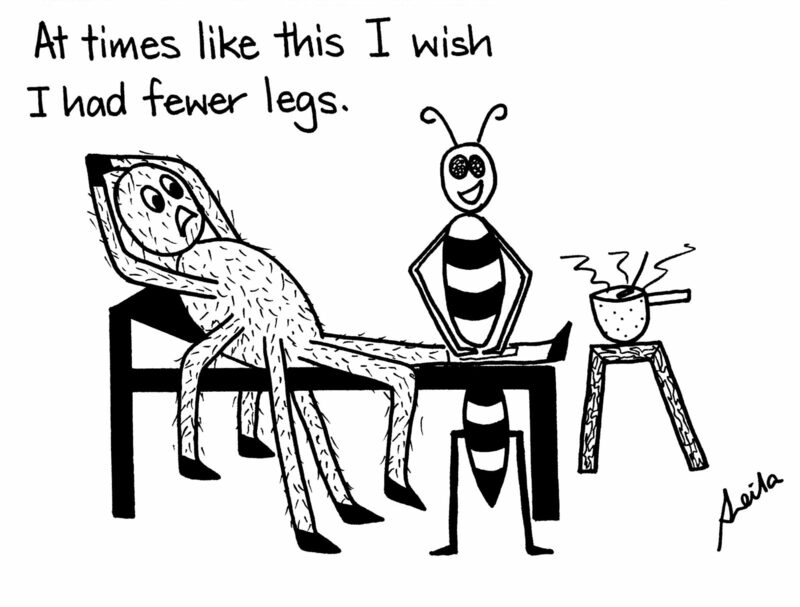 Until the last question that popped up in her head: is he worth the trouble of waxing her legs for the date tonight? As all the hurdles to be crossed came to her mind, the society to be faced, the parents to be convinced, the snoring to be tolerated, the legs to be waxed, it all seemed so overwhelming. Yes, she could push back the decisions to tomorrow and enjoy today. The society had to be faced only after marriage which could be easily a few years down the lane. Even if they didn’t approve there were always some fringe social groups that did not care what you do. The parents had to be convinced only after they decided to break the news to their parents, that could be put back for a few months at least. The snoring had to be tolerated regularly only after he shifted to this city. It would take weeks. The waxing had to be done only before he arrived. It could take almost 20 minutes for him to reach. She was so confused and helpless, the motivational poster on her wall seemed to begin to make sense. The quote read “start with the easy, then move on to the difficult and before you know you are doing the impossible”. She decided to break down this problem, one at a time, she would solve it piece by piece. Starting with the easiest one of course. Yes, she would not sacrifice her hopes because of her fear of the impending hurdles. But this was no school homework. The hurdles refused to shrink after she gave them some thought. Unlike school homework, these hurdles remained as daunting now as they were 15 minutes ago. The society’s judgement, her parents’ disapproval, the sound of his snores, the unused waxing strips, the ticking clock. He would reach in less than 5 minutes to pick her up. She realized she did not know anything. She did not know the answer to her question, she did not know if she could fight the hurdles and not lose her sight of the goal. She only knew she had to make best use of the tools at her disposal and put up a fight. This piece was written at a session at Write Club on 20th August, 2016.